they made the trip very enjoyable. they make it easy for the traveler, since everything is planned. they go out of their way for the traveler. all of it. the beauty of the canyons is breath taking. Yes I certainly would recommend to others. This trip to Canyon Country was my fourth trip with Collette. As in the past, it was excellent in every way. Everything about the trip was fabulous. I love Collette tours. I have never been on a tour organized by a company because they are rather expensive. My friends were celebrating a significant birthday as was i so we decided to go on at trip. This was chosen by one of the birthday celebrants and we all got on board. I really enjoyed the tour. It was well worth the price. It covered everything - trip to airport, flights, and everything else that was tour related; a number of meals were included. The bus trips from place to place were not that long considering the ground we needed to cover. Our tour guide was excellent. We were doing something every minute that we arrived at our destinations. Our tour guide was wonderful and made sure we got to see things that he thought we would enjoy - like seeing the Grand Canyon at sunset as well as at dawn. We learned a lot about each place we visited. All we had to do was enjoy the trip. No worries about traffic, ticket purchases, etc. I really was impressed. Great tour. Excellent tour guide. Canyon Country trip ... total delight. To visit the canyon country was a priority item on my “bucket list” and our guide made that the most memorable trip of my life. He was so thorough in attending to every minute detail, and made every person feel special. He was remarkable and represented your company in the most favorable way possible. The whole canyon experience was incomparable and a total delight. The one thing that was not so good was to end the trip with two days in Las Vegas. One day there was more than enough. The agenda was marvelous. The tour guide was incredible. My favorite experience was viewing Bryce Canyon and the care the guide gave to give us information about it to enhance our appreciation of it. Our tour guide was wonderful..,. very knowledgeable. He made the trip. The bus was very comfortable. We saw so many things in a short period of time. Loved it all but probably Zion National park was the best. Driving down into the canyon was spectacular. it was a great trip the tour guide and bus driver were very nice and knowledgeable.told us a lot of facts about the area and were we were.food was good hotels we stayed at were great and different also clean.met alot of new people on bus became friends.would do another trip this time to cowboy country. Our church uses Colette and we have always had good experiences. On recent tripwe had great driver who navigated the mts well. Lake Powell was beautiful. Was disappointed in lodging and dinner at Grand Canyon. Otherwise good. Paris hotel in Vegas was good choice of location. Good food. Tour guide excellent. Our tour guide, Barry and bus driver Mark were wonderful! They were both knowledgeable, courteous and professional, but also friendly and a joy to travel with. We packed so much into 8 days of travel; visiting sites I would have missed if I traveled on my own. Bryce Canyon was my favorite, but they we all breath-taking. Rachel did a wonderful job as our tour director! Great trip, great travel companion! Beautiful and memorable trip! Organized! Canyon Country was amazing. Our tour guide Barrie was great! Collette always does a nice job for us. Yes I would and do recommend Collette. If there is one thing that could be improved upon it is after a long flight there should be a room available and there never is, because we arrive at our destination so early. Perhaps a lounge where people can rest could be arranged. The whole trip was memorable. Too much great stuff to choose. My wife Sandy and I thoroughly enjoyed the Collette tour "Canyon Country" last year from September 7th-14th, 2018. Our tour guide was Mark Cunningham who was outstanding! Our tour guide, Mark Cunningham, was outstanding as he narrated our tour and told the historical background of everything that we were seeing. Our favorite experience was getting to tour both dams on an "inside tour" during our free time. Tour guide and driver where excellent. Hotels were good. Tour itself was great. Poor choice of travel director who did not add a positive experience to the trip. Very little knowledge of the areas except for what she read on her phone. Too much time on the bus with no creativity for helping pass the time on long rides. More time should have been allowed at the canyons besides "photo shoot" time. Wished there was more time in Sedona. On a positive note.....very experienced driver and wonderfully comfortable tour bus; accommodations were fine; traveling companions were very nice and responsible; did get to see the expected sites. Seeing the Grand Canyon was an awesome experience. Sharing the trip with our friends made it special. Loved everything about Lake Powell. Thank you for traveling with Collette on our Canyon Country tour. A member of the Guest Relations team will be reaching out to discuss your feedback. Not up to the standards from our last Collette trip. Tour director left a lot to be desired. Leak in the lobby at the first hotel we stayed at. multiple stops at gift stores---and Walmart. Driver was very professional and helpful. Loved Lake Powell and Zion. I was impressed with Bryce Hill and his tour leading abilities. He made the trip fun and interesting with bits of history thrown in that I've never before gotten from a tour director. Bryce deserves a raise! The canyons were the highlight, of course. I would have liked to have had one more day of canyons and one day less of Las Vegas. I would also liked to have had both the Monument Valley excursion AND a Slot Canyon excursion option instead of having to choose between the two. Mark Cunningham is a great guide. Always something interesting and informative.Well planned and executed. I enjoyed all of the tour. I had been to most of the places we visited, but had not seen all we saw. Mark Cunningham brought us to places one does not see on the average trip. Not happy 1st and last tour. Thank you for contacting us again in regards to your luggage fees. Your feedback has been passed along to our Client Care Center. Great time in the Canyons! Everything went smoothly from start to finish. We liked how organized Collette was. We had a terrific tour director, Mark and tour driver, Anna. They made our trip fun and so stress free. Mark was very educated and Anna was a delight. We have great memories and Will definitely use Collette again! Oh, and the transport to/from the airport was an added plus! We loved all the canyons, the Grand Canyon, Bryce and Zion. Zion was our favorite. Las Vegas was our least favorite. One more day at Zion one less day in Vegas would have been ideal. Lake Powell was beautiful but would have preferred another excursion choice. We heard the 1 hour morning tour of the Antelope Canyons was fascinating. The 2 1/2 boat tour was nice but a little long on a hot day. Very organized. Great choice of places to see. Wonderful hotels. Excellent bus driver. Terrific guide. Very good restaurant choices. Beautiful and immaculate bus. The scenery at each park was magnificent. At Lake Powell in the evening the park rangers set up powerful telescopes to see the stars and planets. We were able to see Jupiter and the rings around it, along with Venus and Mars. The rangers also pointed out with a laser all the constellations. So impressive and a wonderful surprise. They do it once a month and we were lucky enough to be there that night. Had a great time and I would recommend the company to anyone. everything was wonderful. I had a great time with the whole trip. I would tell anyone to book the same trip. I would have given it five stars but I didn't care for Las Vegas. Too expensive and too busy for this country boy! Monument valley, Grand Canyon Bryce canyon and Zion Natural Park were excellent Thank you, thank you and thank you. As previously listed .. This particular tour could have been a few days longer. Would have liked more time other than lunch In Sedona. Favorite part of tour is Bryce Canyon. Tour manager, Kim, was fantastic. Itinerary exactly what we wanted, hotels and food great, bus and driver couldn’t have been better. Itinerary perfect. Grand Canyon was amazing! It was very organized and our tour guide was the best! I would recommend your service to anyone. The views were terrific however talking to the different tribes was very educational. Collette was excellent. The trip was well-planned and executed. Meals were very nice. There could have been a few more mirrors at the Marriot. American Airlines was fine, I've previously complained to you and them about our return on United. Without the trip home the trip would have rated a 5. Bryce Canyon. Breakfast at the Paris. Thank you again for reaching out to us regarding your Canyon Country tour. Your comments have been passed along to Collette's Air department. We are grateful for your business and hope to see you again on another Collette tour. An outstanding "Canyon Country" experience! Our tour was a wonderful experience. All aspects of it were very organized and proceeded smoothly. Our tour guide and motor coach driver did an outstanding job of providing information as well as making us comfortable. The hotels were very clean and pleasant. The tour certainly met if not exceeded our expectations. There is too much to review here. I loved the Lake Powell cruise and Bryce Canyon. Tour guide good.......Parks were beautiful. Thank you for traveling with Collette to canyon country. A member of the Guest Relations Team will follow up with you. Barbara was an excellent tour guide! Workers at Lake Powell were not helpful and didn’t want us to complain to the manager on duty. The manager on duty wouldn’t listen to our complaints. Thank you for traveling with Collette on our Canyon Country tour. Your comments have been forwarded to the Product Manager for this tour. She will use your feedback to enhance this tour for our future guests. Our tour director, Barbara , was excellent! She did a great job, and was always intune to all of our needs. I did not like the hotel the we stayed in at the Grand Canyon. It was not clean. The room was dusty , contained mold, and mildew. The Native American’s were both very informative. It added to the quality of the trip. I loved monument valley. Stunning! Our tour guide was excellent, giving us an all over view of the valley mountains. So memorable. Thank you for traveling with Collette to Canyon Country. We will share your concerns with the hotel to prevent future problems of this nature. We thank you for your feedback as it allows us to take action and alleviate the problem for future tours. Amazing Tour!! My husband and I had an absolutely wonderful time! Each day was planned very well and another adventure to look forward to. Our tour guide, Mike was so knowledgable and accommodating!! Our bus driver was outstanding, polite and very courteous. The Grand Canyon was spectacular as was Bryce Canyon, Zion, and Monument Valley. We especially liked the excursion to the Hoover Dam. 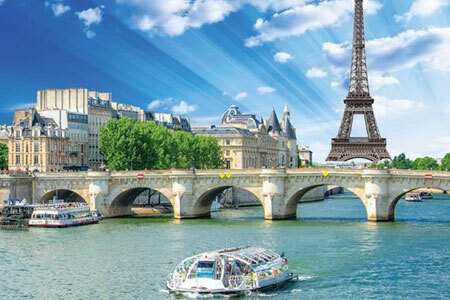 We look forward to traveling with Collette Tours in the future!! Our favorite experience was seeing the Grand Canyon!! The views were spectacular and the timing of the trip, in October was perfect!! Everyone was very friendly and nice. It is hard to tell what was my favorite park. They all were beautiful. Our Tour Manager, **** **********, was beyond excellent. He was so knowledgeable of the area. ** ******, our bus driver, was equally as good. We felt safe at all times. Together, they made our trip great. The tour manager didn't seem as well informed as others we have experienced. The included tour stops were very scenic, especially Sedona. Would like to have spent more time there. The food at the provided meals was good. Thought the fact that same itinerary bus load of Collette tourists should not have been scheduled at the same stops at the same time. Made those stops, at times, very crowded. Our group leader was wonderful. She kept us on schedule but in a very nice, professional manner. She was very knowledgeable. The hotels, excursions, food was all superb!! Bryce Canyon was our favorite. I work through Becky at Orchard View Travels. I recommend Collette all the time. Barry was a great tour manager. I liked having the one day when we could choose what activity we wanted to do. Good choice of places to visit. Good organization. We have used Collett 7 times. Enjoyed our vacation and got to see some great national parks! The trip through Canyon Country was really great and being in a group setting was nice too. The only thing worth changing would be allowing a few hours or a day more to explore these parks. There is just not enough time to hike any trails in the park before moving to the next destination. All the parks were memorable and were so beautiful to see. Alsogreat weather helped. Had a wonderful lifelong dream trip. Our guide ***** was very well informed about the area. Her info truly added to the majestic scenery. The accommodations were lovely. Wonderful views everywhere. Would and have recommended Collette and *******. Would have given 5 stars except for very early starts would have liked 8 am! And breakfast buffet a bit much the same. Got weary of that. The Grand Canyon was incredible but I wish there was more time in Sedona. Excellent tour, I had an awesome time. The hotels were 1st rate, the food was very good and the tour guide was very knowledgeable. It was Zion and Lake Powell. Zion was beautiful! Everything was very well organized. The local agent was very responsive to any of our inquiries. The tour manager was knowledgeable, friendly and caring. 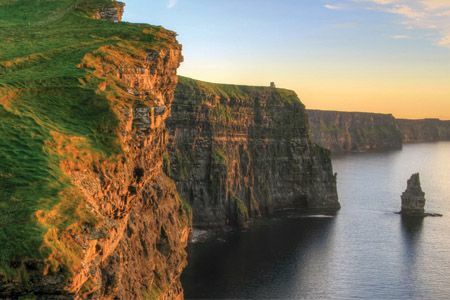 The tour touched on the sites that we really wanted to see and provided many breathtaking views and scenery. Hotel accommodations were more than adequate. Fabulous time, will book another tour with Collette! The service we received on our Canyon Country trip was absolutely the best. From the time our driver picked us up from the airport until he dropped us off home it was an awesome time! Our tour guide and bus driver were also very informative and made our trip great! It is hard to provide my favorite experience because every place we stopped was so beautiful. Overall the Grand Canyon and Zion were so majestic, however Bryce and Monument Valley were also spectacular! Exactly what the brochure depicted. Everything that we wanted to see and experience, except the last stop. Could have eliminated Las Vegas would have been better to stop at the Hoover dam instead. Almost all of the other passengers felt he same way. One comment would be to have a room facing a view instead of always in the back of the hotels. Excellent tour. Our tour guide, *Personal Details removed by Feefo* was very knowledgeable of all the sites on the tour. He was well organized and a pleasure to guide the tour. Would highly recommend the Canyon tour! Every location was outstanding - hard to pick a favorite as they were all magnificent canyons. Everything was well organized. Our tour manager was terrific! She was knowledgeable, thoughtful and energetic. Our bus driver was excellent. Skillful and courteous he couldn't have been any better! To be able to see all the different views at the Grand Canyon, Bryce Canyon, Monument Valley and Zion National Park was truly amazing! Enjoyed the whole trip! Tour manager made it very fun and she was helpful and knowledgable. Would have liked another night at Zion. Saw all I could take in! Friendly group, bus driver superb, Tour manageer excellent! well informed tour manager,detail oriented,.. personal. could have used another day in grand canyon. 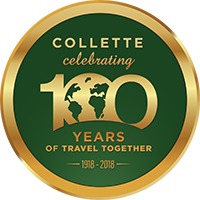 We will continue to use Collette travel. Leader of the tour was great. The overall tour could have been a little better. With the addition of a train ride into the Grand Canyon would have been an improvement. The trip to Monument Valley was a D+. The young fellow leading the tour thought the mountains were at least a 1000 years old. Other then that, with the addition of a train ride into and out of the Grand Canyon would have made it a 5 star tour. The locations we visited, hotels and restaurants that were included, tour guide, bus driver were the best and certainly exceeded our expectations. This was our first guided tour and because of our positive experience, we will do it again. Collette will be the tour company that we would use again. they were so organized and we didn't have to worry about anything but enjoying our trip. Seeing the Grand Canyon for the first time took my breath away. We were taken to several points where we could see it in different ways. Canyon Country tour was flawless and "visual overload." Tour guide (personal details removed by Feefo) wasa five-star all by himself, and so was (personal details removed by Feefo) the bus driver. Grand Canyon was great (had been there before) but Monument Valley, Bryce and Zion were especially awesome (especially Bryce). Your tour guide (personal details removed by Feefo) was amazing and really became part of the experience. Your one nearby was well planned and not annoying with longer stays between certain stops. First time touring and certainly not last. Awesome scenery someplace for everyone's bucket list. 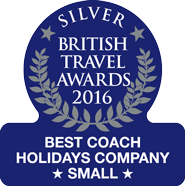 Fantastic trip , wonderful scenery, transport exceptional especially coach driver. Food that was included in trip( which wasn't a lot ) not as good as expected. Excluding the Paris complex which was very good. Guide on the trip was a pleasant young lass but I felt she needed more experience which I'm sure she will get the more she travels. Think Collette should include as an extra the Canyon helicopter and boat trip. Also feel we could have stayed an extra day in Zion Park rather than Vegas. Fantastic trip with unforgettable scenery. See above. We got as far as Sedona. We're sorry to hear that your partner came down with E. Coli. We have passed your feedback along to our customer care team so that they can help you further. If you have any questions feel free to reach out. Every little detail is taken care of. Our Tour Director Abby was amazing. Most memorable was Zion Canyon, because we were able to be down in the canyon and look up. This is a wonderful tour, which I highly recommend! It included the scenic areas we wanted to see with extra stops for photos. This tour took us to four beautiful National Parks! We visited the Grand Canyon, Monument Valley, Bryce Canyon, and Zion Canyon - plus we did two optional tours for a close-up jeep tour in Sedona and a "desert" cruise. Our favorite was staying overnight in a hotel at the bottom of Zion Canyon! Canyon Country was all I had hoped for and more. The views were magnificent and the trip itself was a great value. Thank you, Collette! Sunrise view at Lake Powell. end of tour not organised,left to own devises on friday and saturday. scenery was fantastic, jeep uncomfortable. Have used Collette in the past and have never been disappointed. Wonderful Experience to Canyonlands USA! 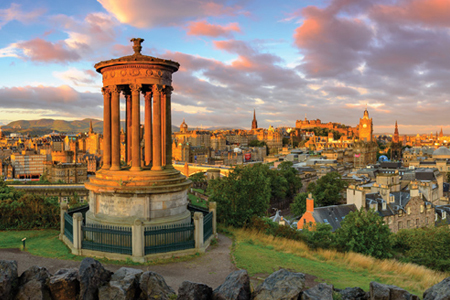 Great guide, on-time everywhere, excellent accommodations, tour options, and included meals. Close to being five stars but I would have liked more time at each of the major stops. Enjoyed all the travel and sites--also the people and tour director. Especially good tour guide, Joe Stringer. Everything just fine. Zion was way beyond what I expected! Lake Powell was beautiful and I especially liked the Arrapaho Indian speaker. Have traveled with Collette, trips are well done allowing me to just sit back and enjoy!! 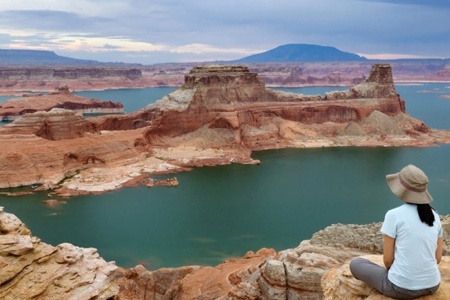 Was surprised by Lake Powell and by the number of international tourists visiting our canyon country. All of our expectations were or exceeded. Smaller sized group would be better for older adults. In the future, I would be more selective and search a tour group that is smaller than 40+. Although this tour worked well with little to no bad feelings about seating rotations or exiting the bus at stops, a smaller group experience would be better for people 80 years old. I would recommend the company with reservations as listed above. I would use them again if they had smaller tour groups. The Tour Manager of this tour was excellent...had great knowledge and managed the group well. There was a wide range of ages in this group...children to older adults. One of the locations the tour visited was the main reason we took the tour. The visit to the Navajo Reservation National Monument was the highlight of the tour. Had visited the other locations, but the added value of the information provided by the Tour Manager or others made the trip very worthwhile. This was a wonderful trip, it covered some of the most beautiful places in the US . Colette finds the greatest places to stay, chooses the best choices of eating and also makes sure that the history of the area is given to the traveler. Our tour manager, Jeannine was alway happy, available for anything and very informed about the places we visited. To choose one memorable experience is hard because the entire tour was memorable. I have tried to email you since our return but the email address I have found saying that this is away to contact you have not worked .There are several reasons why i will not use Collect again. 1. Before we left Uk you our travel agented phoned us and said you wanted to know if we wanted a smoking room at the Paris hotel Las Vegas. We said no. When we reach the Paris Hotel Vegas you have put us in a smoking room. 2. The transfer vouchers from the Paris Hotel to Vegas airport were not issued and the tour guide made rather a thing of it saying she needed to check through our documentation as we might not Know what it looked like. The fact that there were several of us did not matter. 3.We stayed at the Paris Hotel Thursday Friday and left on the Saturday. In our documentation it said we had a breakfast provided. When we told our tour guide this she said show me proof. We showed her the evidence but would not accept this and would not issue vouchers. It was not just us but two other British couples had the same info that there should have been breakfast on the Friday. The tour guide also thought that we had booked an extra day in Vegas when we had not. 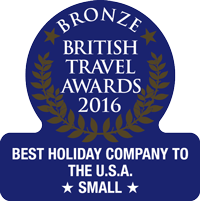 So altogether not at satisfactory holiday and this was the 3rd one we had booked with you. 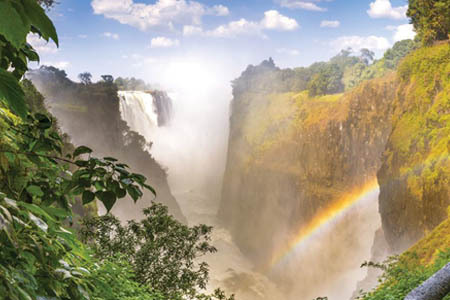 We have told our travel agent that we are looking at a holiday to Canada but you would not be our preferred agent where as in the past you were our number 1 tour provider. Worth going for another trip. Great tour guide, hotels, excursions. Great service, took care of every single detail. Seamless service. Seeing the four national parks was awesome and magical. Beautiful sunsets and moon rises. Stunning views. Great! Looking forward to our next Collette tour. The tour was exceptional. Everything we hoped for. The best way to take a vacaion. The Tour Manager, Mark, patiently explained items several times. He kept a comfortable commentary about what we would be seeing and why throughout the bus tour. 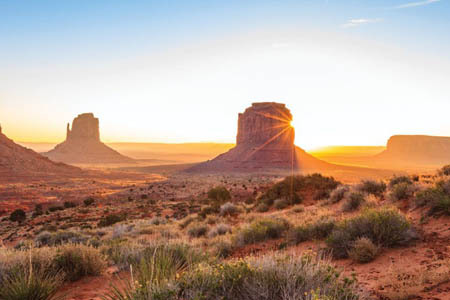 Travelling through America's Canyon Country will bring you into a colourful world of stunning southwestern vistas and to the neon-lit spectacle of Las Vegas. Air passengers will arrive into Phoenix, Arizona airport. All transfers will depart from Phoenix airport for Scottsdale. On this tour, we are proud to stay inside Grand Canyon National Park and immerse our guests in the full national park experience. We always work to provide our guests the best possible accommodations. However, these types of hotels are only open to guests a small portion of the year because of their locations. Thus, they generally are not updated as often nor will the staff be as experienced as year round properties and may not be up to the standard that you will find in other locations on a Collette tour. But we feel that staying in these hotels is the best way to give our guests the time to truly get to know the park, soak in the unparalleled scenery, and we are sure the accommodations will be satisfactory.